Ever heard of Bakerella? If you haven't, go ahead and check out her site, I'll wait right here until you get back. If you have heard of her, then I'm willing to bet you are as enamored and envious of her great ideas and yummy treats as I am! She's a favorite of mine because she loves to play with food and likes to find different ways to use regular ordinary sugary treats. 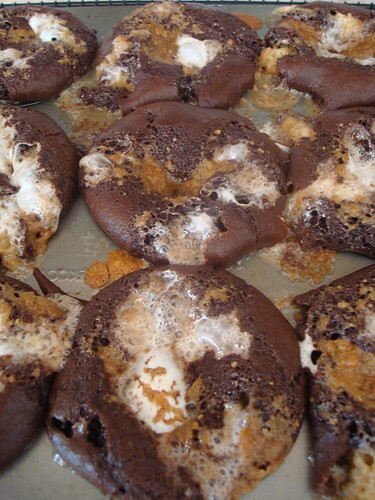 Recently she created S'mores cupcakes. Oh, the pictures of her little cakes made me want to try some- they looked delicious! So I started out following her directions. In no time at all I had three different bowls of batter and began layering them in muffin tins. 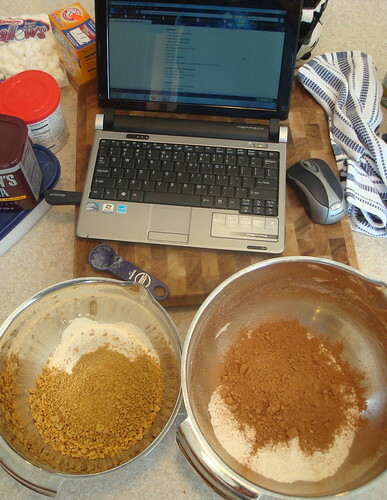 First, a vanilla graham cracker cake layer and then some buttery, sugary, graham cracker crumble. Next, the marshmallows and then a decadent chocolate cake layer. If you try nothing else, please, please do yourself the favor of making chocolate cupcakes using Bakerella's recipe for the chocolate layer. The batter itself tastes like fudgey frosting. yum... And finally, top it all off with more of the graham cracker crumble. Into the oven they went and when that timer went off a short 15 minutes later, the smell was amazing- just like toasted s'mores! 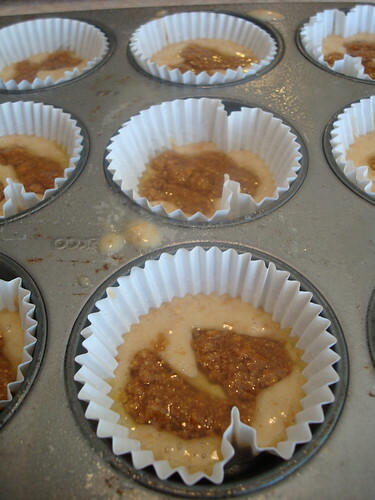 Bakerella suggests you put a cookie sheet underneath your muffin tin to catch any drips. Good advice; they are gooey and messy and they overflowed. I would add to that suggestion that you cover that cookie sheet with tin foil, that way you can trash the foil and not waste your time scouring hardened marshmallow of your nice cookie sheets. 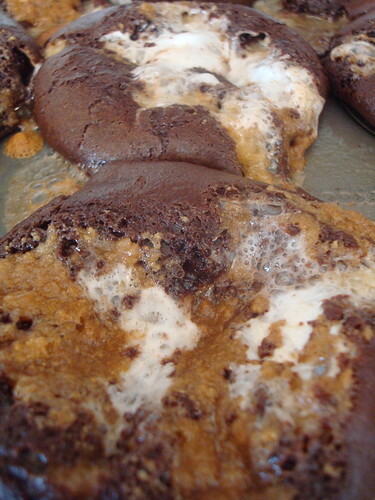 Gooey, melty, oozing cupcakes full of chocolate and marshmallow. 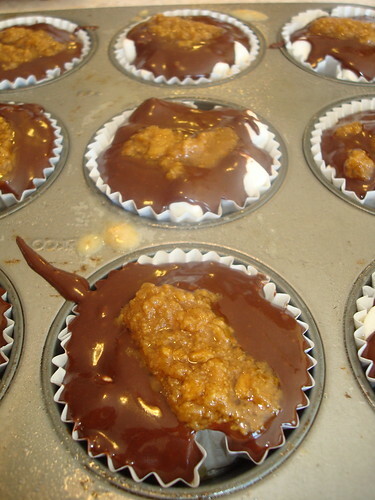 Just make sure you spray every little bit of the surface of your muffin tin before you start filling your cups, marshmallows are sticky. I could not wait for these to cool enough to tuck into one and see if they lived up to the way the smelled and looked! My cupcakes completely deflated. I was left with a cavernous hole where the marshmallows used to be. I thought I could save them by maybe refilling them with fresh marshmallows (the instructions encouraged me to garnish the cupcakes with more marshmallow) and then cover them with chocolate ganache. I waited until they were cool and then tried one and they were not salvageable. While the chocolately tops of the cupcakes were baked perfectly, the melted marshmallows had turned the vanilla graham cracker layer back into warm wet cake batter. 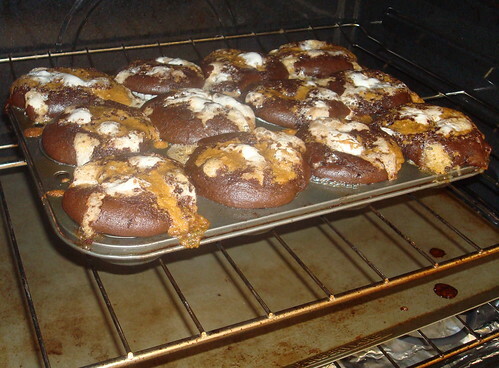 Even though the house still smelled like warm baked s'mores cupcakes, I couldn't serve them to my guests. So here's where I appeal to you: have you made these? Did they turn out right? What did I do wrong? 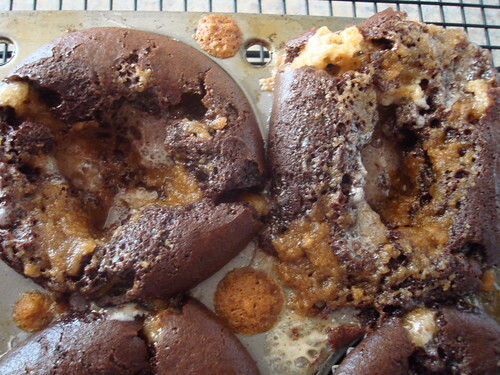 This was probably my first attempt at baking with marshmallows, and I know they tend to puff up and then deflate a little, but why did it liquefy my bottom layer of cake? And, tell the truth, would you have eaten them anyway?